Thanks mates! The captain is happy to receive your parrot, we'll respond with a message in a bottle soon, watch for it to wash up on shore! A captain in her own right and a fore to be reckoned with we may add! She's a true pirate, born and raised on the sea, her energy never lets up. You should see the mastery of her skill emblazoned upon your arm in the form of a fresh pirate tattoo! A classy pirate, best dressed and always there to impress, Moonbeam lights up the day or night and invites you to revel in your imagination and create pirate world full of splendour! Mick is one of our finest crew, he's sailed for many a moons under different flags until finding his way to join our crew in Toronto. Soon often to other adventures on other bodies of waters up in Barrie where he'll be captain of his own crew! Captured not once, nor twice but thrice & thrice escaped the gallows. Red is a man of the people, elected as Quarter Master, responsible for the on goings of the crew, the divvying of the loot and proper upkeep of the ship. He stands on high moral grounds for a just cause - not just because. They call him Blackboot even though he wears brown sandals. 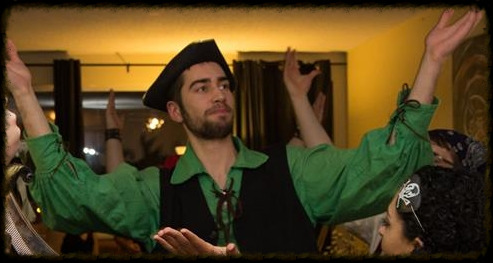 He hails from the Ottawa river - one of many pirates in the area. A natural born leader, artist, engineer - did I say engineer? I mean ship's engineer - his's multi-faceted talents never cease to amaze. Blackboot for Prime Minister. She's a saucy sailor, no doubt. 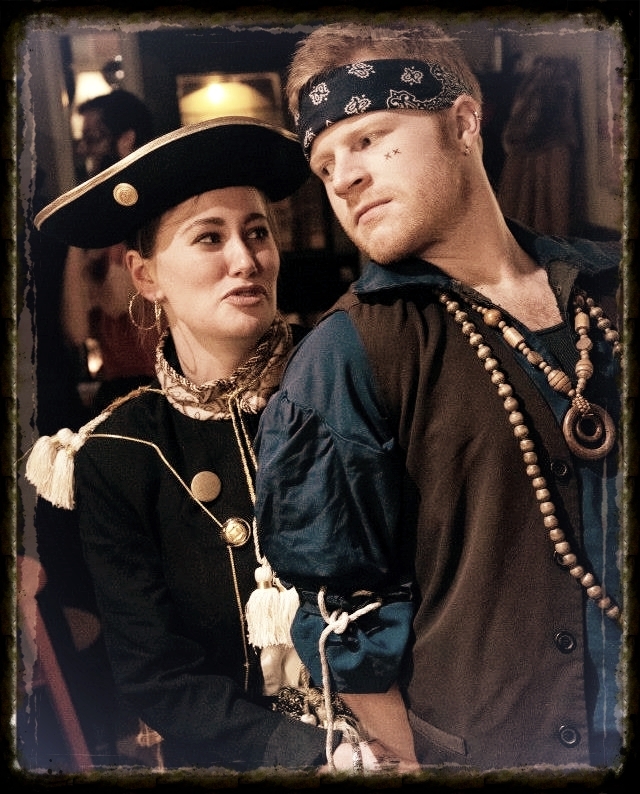 Once a pirate princess stolen away from her crew by the Dread Pirate Roberts himself, she of course, challenged him to a game of wits and charm, which she won, and therefore took back her crown steeling away his very ship! She found herself longing for camaraderie and was welcomed aboard the Island Rogue - a place she now calls home. Having sailed in from across the pond (great lakes) this buccaneer knows a thing or two about the pirate life. Her charm and charisma let you know you are in good hands, unless of course it's all a clever deception so she can make off with the treasure! A mighty fine pirate, Gwendolyn is always prepared to answers the Bosun's call and find her way right to where she's needed most! We didn't know it at first, but Dave would turn out to be a regular jack of all trades taking on all sorts of tasks and duties amongst his crew mates. He's the first mate, that a captain cannot do without. A charming young sailor, he's got music in his bones, a rhythm in his shoes and a song fer every lad or lass he encounters. As confident with the blade as he is with the guitar - a shining star in our crew especially when spirits are blue! A salty sailor who is years beyond he is wise, born on the islands, raised a pirate. He did attempt the corporate life but was shunned for commandeering the water cooler, making rum punch and unabashedly scribbling treasure maps on all the invoices. 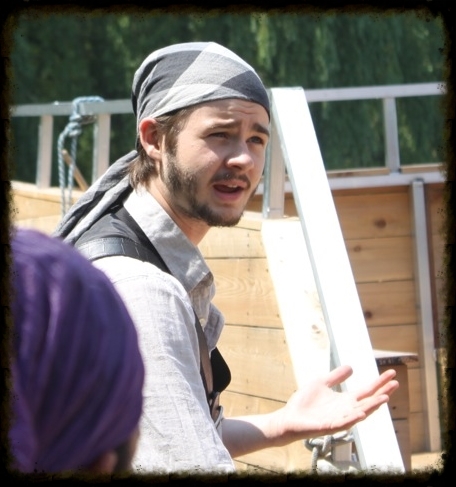 He's much more comfortable at the helm of the Island Rogue or on shore with his mates, close to the waters edge, inspiring future crew and buccaneers! Music is found in her soul, this buccaneer made her way just nicely into the upper ranks of our crew where she grew and grew in energy and skill aboard our very own Island Rogue, sailed away for the winter but due to return soon! You've come from near and far, your opportunity is now so tighten your buckle, grab a bandana and sword. You're a part of the crew now. One of us... the adventure awaits! It's not just for her fiery red vest that she's named Scarlett, but for her passion and love of the seas. Trained in the ancient pirate art of 'Improv' she always captivates an audience be it through telling a tall tale, dancing a sailor's jig or enchanting us with her voice. She lights a scarlett flame of inspiration and admiration in all of us as. We are an arts & entertainment company that provides an interactive theatrical experience coupled with a boat cruise around the Toronto Islands. Our redesigned vessel was rebuilt to look and feel like a pirate ship while maintaining the comfort of a steady boat with an operating diesel engine. The cast and crew are all local actors and entertainers, some will be students and debutantes, others seasoned vets - the important thing is to love to act, to inspire, to create and most of all, to have fun. Ask ter par-lay with the captain, if ye dare! Have you or someone you know ever been a pirate for Halloween? Ever since reading the classics in 'pirate literature' in which the pirate life was greatly romanticized, such as Treasure Island, Peter Pan and most recently with the Pirates of the Caribbean saga, we've fallen head over heels for the love of the sea, adventure and captaining one's own vessel - so to speak. So why not bring these stories, movies and feelings to life with a theatre and cruise right here at home in Toronto. What better place than Centre Island, where families have been taking their children for generations to enjoy the vast park and various attractions so close to home. I sure remember my childhood trips - how I would have loved to search for a treasure as a pirate then! We began with sketches, consulted an architect, approached the City of Toronto and began construction. It's been a year or so in the making, the vessel is complete and now we're hiring pirates to join our crew and live a Pirate's Life!